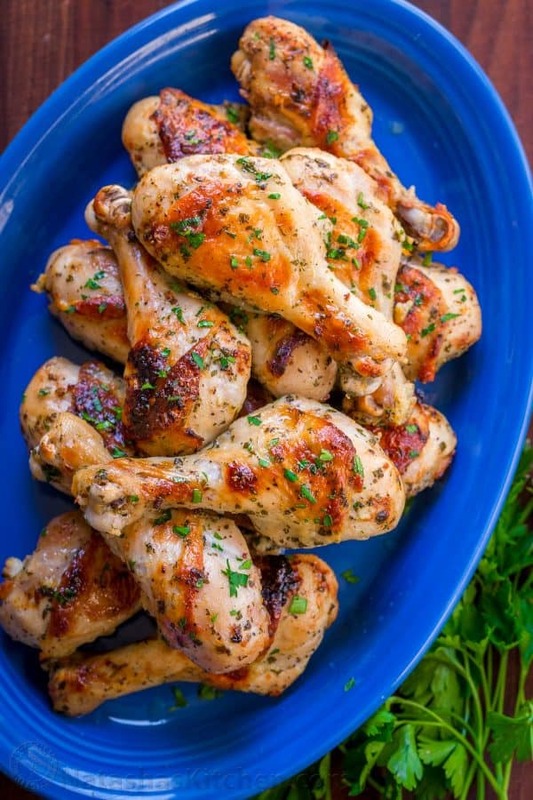 These chicken legs are baked with a garlic-lemon-dijon marinade that is easy and excellent. The ingredients are simple and just work. Have you tried mustard on chicken? HUBBA HUBBA! The marinade on these baked chicken legs is zesty and so fresh. Smell it as you are stirring and it will make you all kinds of excited. Bonus: your house will smell completely amazing while the chicken drumsticks roast and you’ll get compliments even before they come out of the oven. P.S. The secret to excellent chicken legs is lengthy marinating. The longer you marinate this, the better (at least 6 hours and ideally overnight). The chicken will be tender, juicy and flavorful! P.S. 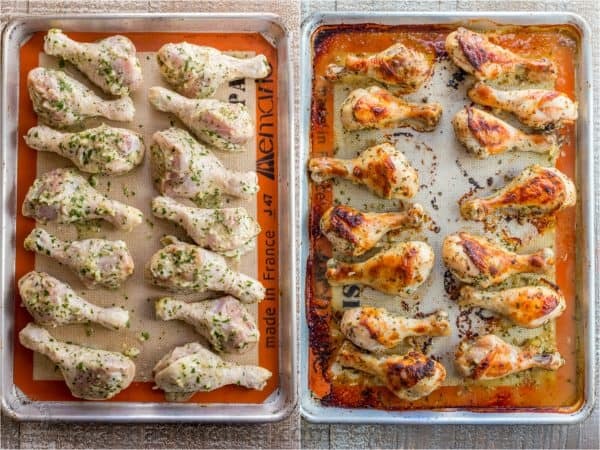 Want to know which tools we used to make these baked chicken drumsticks? See the Amazon affiliate links in the instructions below. 1. In a small bowl, combine all of the marinade ingredients and stir or whisk together until well blended . 2. Transfer chicken legs to a large mixing bowl or a large ziploc bag. 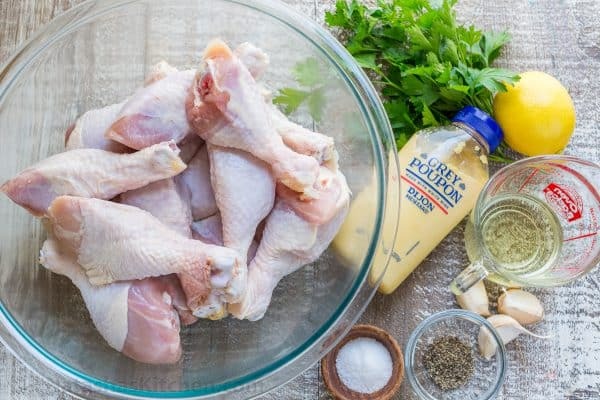 Pour the marinade over the chicken and toss with your hands to evenly coat the chicken, pushing some of the marinade under the skin of each chicken leg for richer flavor. 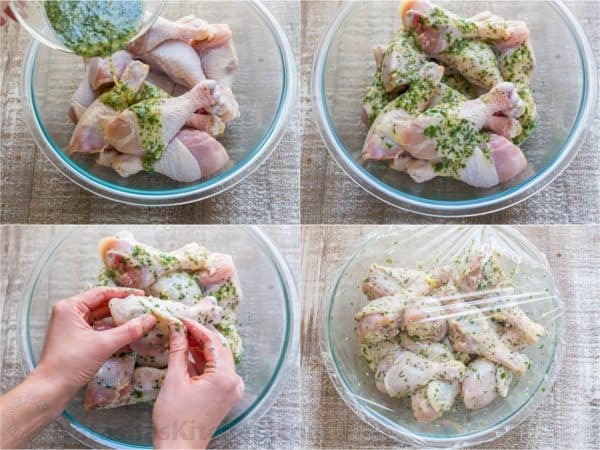 Cover with plastic wrap and marinate 6 hours or overnight, tossing chicken once while marinating. 3. Preheat oven to 400˚F and line a rimmed baking sheet with foil or silpat liner. Arrange chicken skin-side-down and bring chicken to room temperature while oven preheats. Brush chicken legs with any extra marinade left in the mixing bowl. Bake at 400˚F in the center of oven for 25 minutes skin-side-down then turn the chicken legs over and bake additional 25 minutes skin-side-up. For crispier skin, broil on high heat 1 to 3 minutes or until skins have browned. 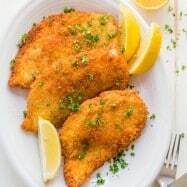 For extra flavor, brush chicken with the lemony sauce drippings in the pan after they come out of the oven and serve garnished with freshly chopped parsley if desired. 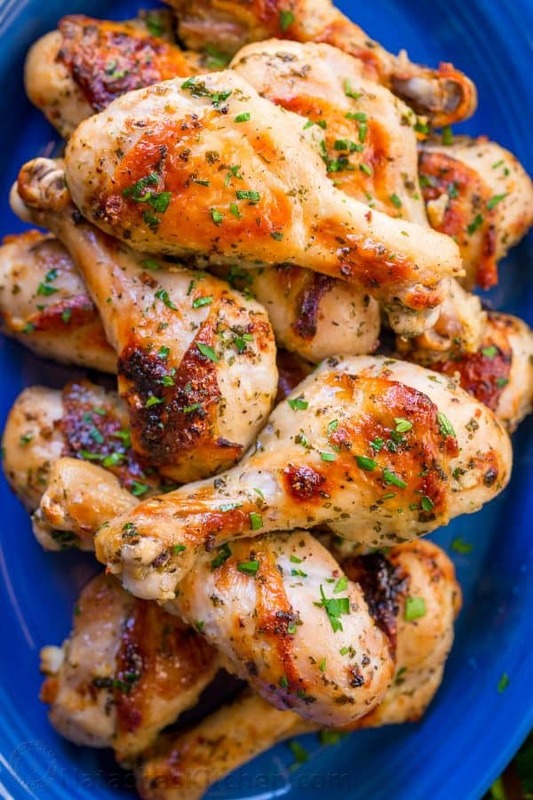 These chicken legs are so completely amazing! 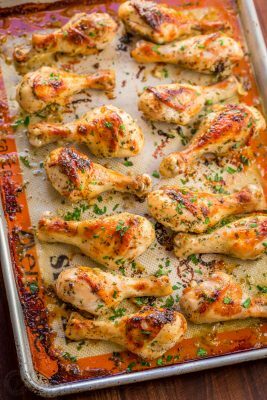 Baked Chicken Legs recipe with garlic, lemon and dijon. 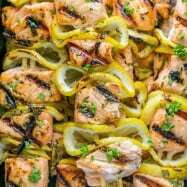 An easy and excellent chicken marinade with so much flavor. The longer you marinate this, the better (at least 6 hours and ideally overnight). 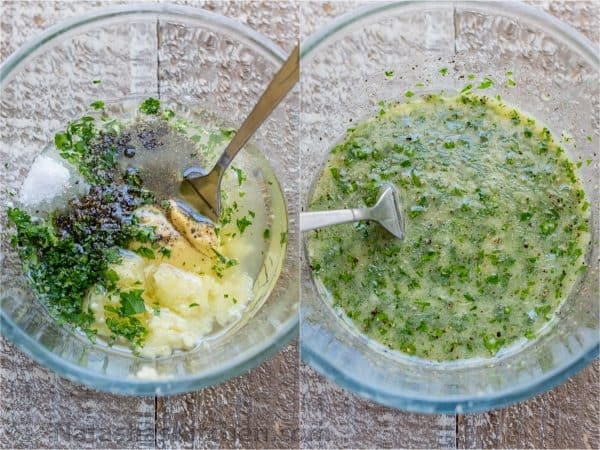 In a small bowl, combine all of the marinade ingredients and stir or whisk together until well blended . Transfer chicken legs to a large mixing bowl or a large ziploc bag. 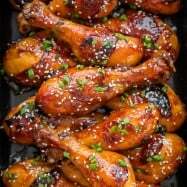 Pour the marinade over the chicken and toss with your hands to evenly coat the chicken, pushing some of the marinade under the skin of each chicken leg for richer flavor. Cover with plastic wrap and marinate 6 hours or overnight, tossing chicken once while marinating. 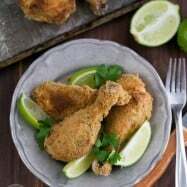 *For extra flavor, brush chicken legs with the lemony sauce drippings in the pan after they come out of the oven and serve garnished with freshly chopped parsley if desired. Note: Much of the oil and marinade will end up in the bottom of the pan and discarded after baking which makes it difficult to gauge the nutrition facts on this recipe. 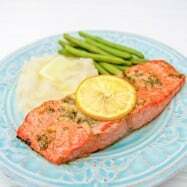 This marinade is based on one of the top recipes on our blog of all time; baked salmon with garlic and dijon. With a few modifications (i.e. more of everything), we discovered it is a winner for chicken drumsticks! My next step is to try this on a whole rotisserie chicken. P.S. Use leftover chicken meat to make this chicken avocado salad (our #1 recipe right now and worth discovering)! I love you blog and visit very often. Lately, I’ve noticed you have so many pop up ads and often it makes the page collapse, which is frustrating if I’m trying to look up a recipe. I’m sure I’m not the only one who’s experienced it, maybe you could do something about it. Thank you for sharing your recipes and we so loved them. It’s really heavenly those recipes I got from your videos. 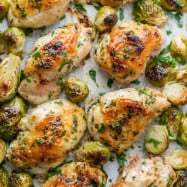 I will try your chicken legs with dijon mustard for new years eve and chicken avocado salad as well. This was spot on for my southern Sunday dinner. We had a crowd of about 20, so I tripled the marinade recipe to cover 30 legs and 15 wings. I saved the pan drippings for an awesome gravy. I used rosemary and thyme instead of parsley and really enjoyed it. I love all mustards, dijon being my fave! Can’t wait to try it tomorrow night as I will set them in the marinade tonight. I am wondering if you have ever tried grilling them though? I also love the BBQ taste that meats can take on 😉 and it’s hot outside so instead of turning the oven on I thought I would try grilling. I usually marinade with mayo garlic and salt but Im glad I found this new great marinade for drums since we have them pretty often. How would a bit of paprika go with this? These sound delish…how do you think this would work with chicken thighs? Hi! What could I substitute lemon juice for?